Heroes, Heroines, and History: What's Your State Song? 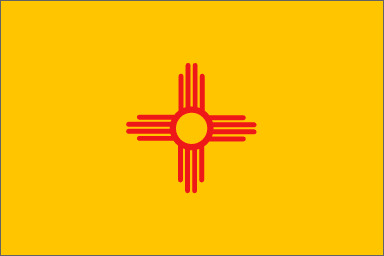 I grew up, graduated high school, and married in the Land of Enchantment-New Mexico. Even after forty-eight years of being gone, I'm still stirred by the state song, learning history we didn't have time for in school, and seeing roadrunners and horned toads. Part of my fascination extends to the remarkable New Mexico women. Long before strong women emerged as norm in our culture, they were carving out their places as artist, potters, writers, miners, inventors, singers, cowgirls, architects, and Harvey Girls. 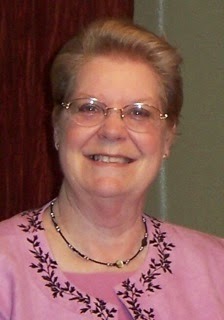 See Cynthia Hickey's HH&H blogs for more information about the Harvey Girls. Plus, my HH&H entry on March 27, 2013 - Hospitality Southwest Style. My mother was a New Mexico Artisan. She wasn't famous outside her little corner of southeast New Mexico, but she had a skill and talent that she honed into incredible pottery and ceramics. She had the gift of seeing liquid colors that looked clear and colorless to me and accurately knowing how much and where to put them on the pottery. She left us with an appreciation for Southwest art and music. Do you know your state song? Who wrote it? Below is the first verse and chorus of mine. You can find the whole song at 50States.com. O, fair New Mexico, we love, we love you so. Elizabeth Garrett, daughter of Sheriff Pat Garrett, penned and published O, Fair New Mexico in 1915 and, after performing the song for the New Mexico Legislature, it was voted as the official state song in 1917 (New Mexico Statutes, Chapter 12, Article 3, Section 5). Yes, her dad was the former Lincoln County Sheriff who shot Billy the Kid. Elizabeth lost her eyesight due to an over-application of blue vitrol to her eyes a few hours after she was born. She graduated from Texas School for the Blind in Austin, Texas. In addition to becoming a nationally recognized soprano, she became a qualified voice and piano teacher. 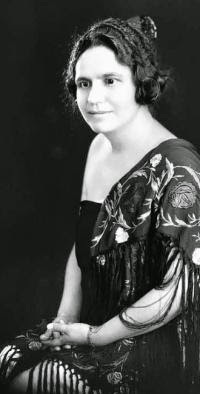 It's reported that eastern "audiences were appreciative of her talents and her interesting compositions about the far-west land of New Mexico." She was known as the Songbird of the Southwest. Elizabeth was a remarkable woman. There's so much more to her rich and incredible history. I was born in Arkansas and lived there until the fourth grade. Not enough time to learn the state song in Arkansas history class. 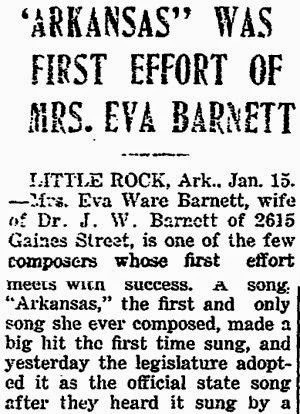 So, I looked up the 1916 song written and published by Mrs. Eva Ware Barnett and Will M. Ramsey. 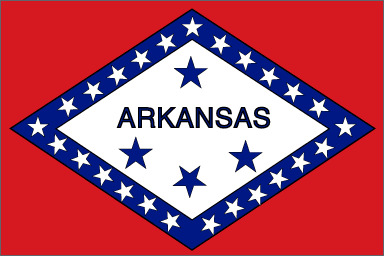 It was adopted by the Arkansas Senate Concurrent Resolution No, 6, in January 1917. Below is the first verse and chorus. You can find the whole song at Wikipedia. I'm confident you've heard Texas, Our Texas during football TV half-times, so I won't jot part of it down here. 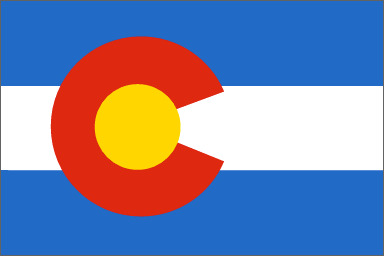 Our new home state of Colorado adopted Where the Columbines Grow written and music by A. J. Fynn on May 8, 1915 (Senate Bill 308, Colorado Revised Statute 24-80-909). Below is the first verse. Read more at 50states.com. You can see how the state's nature and characteristics are mirrored in the songs. Does your state have multiple state songs, anthems or historical songs? If you don't know your state's song, visit United States State Songs. Before you go, I can't resist another question. Does your state have an official cookie? New Mexico has the Biscochito or Bizcochitos. Adopted in 1989, it was chosen to help maintain traditional home-baked cookery. 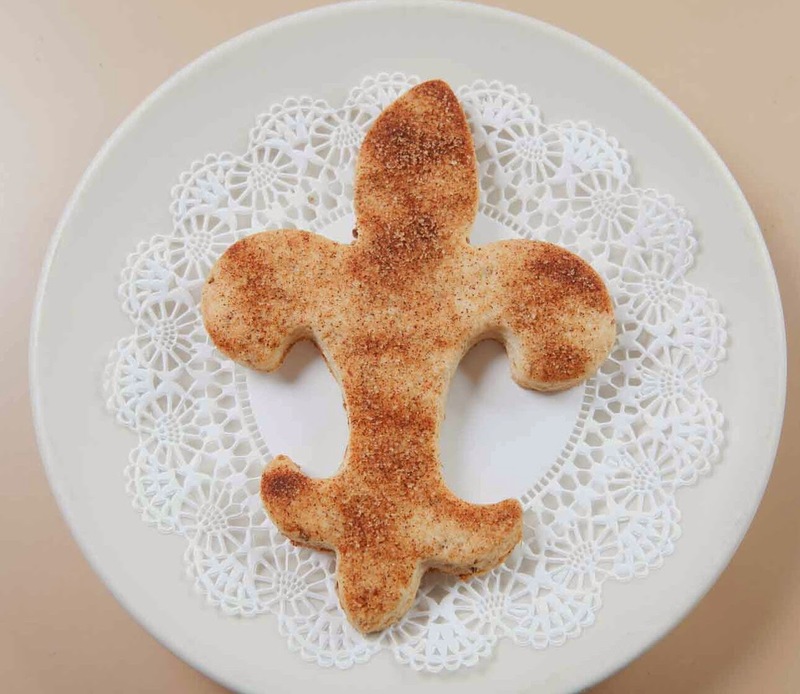 I can see a holiday batch coming up - complete with the Fleur de Lis cookie design that was the original preference. If you try the Biscochito let me know. Lin is learning to bake at high altitudes. A chef in Grand Junction shared that using flour with 4 grams of Protein is the key to reliable Colorado baking. It works. Most popular brand flours have 3 grams of protein. She's been able to bake her father's family famous dinner rolls and popovers. Wow, I never even knew each state had a song. Very interesting! Good morning, Amber. Yes, it is fascinating. I read many of the state songs out of curiosity, and states where we have family and friends. Your state - Missouri - adopted "Missouri Waltz." It was written in 1914 and is played by the University of Missouri's Marching Mizzou at home games. We watch a lot of college football on TV. I'm looking forward to hearing the Waltz played. Very interesting, Linda, thank you. I looked into the song of my home state and was directed to the movie "Beautiful Ohio," which unfortunately I could see (from the reviews) is liberal propaganda. I'm curious to hear the song, however, so I'll keep looking for a link to a good source. Hi Linore, you're welcome. I listened to Ohio's song - my aunt lives in Canton - on youtube. I've emailed you the link - it's long. Enjoy. The Oklahoma state song is probably one of the most famous state songs, since it was the theme song of the movie Oklahoma! and was written by Rodgers & Hammerstein. I've never heard of an OK state cookie before and looked to see if we had one, but I couldn't find any info on it. Our state dessert is pecan pie. Hi Vickie, I couldn't find an Oklahoma state cookie either. My sister in Ponca City, OK, was hoping I could so we could have it when the family gathered. We celebrated with pecan tartlets instead. Connecticut has the Snickerdoodle and Massachusetts and Pennsylvania claim the Chocolate Chip Cookie. I guess state cookie designation is ahead of the times! Hi Ramona, don't the words just fit scenes from the river. I first heard Indiana's state song when the Mill Brothers sang it back in the late 90's. They sang it slow and dreamy. You could imagine drifting in a canoe and watching the stars. Great post, Linda! Texas, Our Texas, is our state song. I think it would be great if all children would learn their state's song. We should all take pride in our states. Hi Melanie, I agree. We sang it every morning after the pledge of allegiance. It did engender state pride. Thanks for stopping by. "Beautiful Nebraska" ... although I had to check just now to make sure I had that right! I have the sheet music and just played it not too long ago. It was written by Russian immigrant who moved to Nebraska in 1952. Of course considering that Memorial Stadium is the third largest city in the state on game day, "There is No Place Like Nebraska" could probably give the official song a run for its money LOL. Hi, Stephanie, it's fascinating the your state song was written by a Russian. Until I researched other states' song, I hadn't thought to notice half-time college music. I will now, realizing that most of them will include the state song. Hmm, I think it will be interesting to chart out the nationalities of state song writers. Thanks for the idea. Hi, Sharon, you're most welcome. Thanks for stopping by. On Wisconsin is the Wisconsin state song. It started as the U of W football team song, but became the state song after someone realized Wisconsin was one of ten states that didn't have a song. We never sang On Wisconsin in school in Green Bay. Only the Packer song. Hi Terri, it's interesting what happens between official and traditional. Thanks for sharing.